I was staring at the water, trying with all my power to make a tarpon appear. There was a breeze, but it was not offensive to our casting; it did however compromise our visibility. Our guide had us positioned so that the wind came from the stern and our shots would be anywhere from 9 to 2 o'clock. The chop and afternoon glare made spotting fish tough, but we did our best, often seeing the fish a little later than we would've liked. It was getting late in the day and though no one had said it aloud, our time was getting short. "One more shot," I thought to myself over and over, even after I missed one. "Just give me one more shot." It was Saturday, May 24th, the afternoon of my fifth straight day of tarpon fishing. 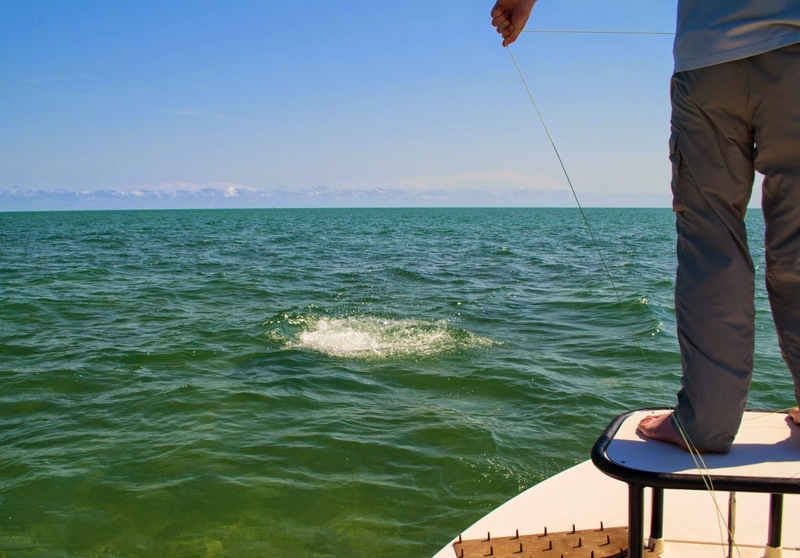 The month had been very difficult for fly anglers in the Keys. A group of two anglers from work had been skunked two weeks prior, and another angler from work had been blanked the week after that. It had been blowing like hell for most of the month, but had layed down the past few days. Finding fish or getting shots weren't the problems; making the fish eat was. I was with three other anglers, all talented and our stats for the week were miniscule: seven eats between four anglers in five fishing days. Ouch. Finally the dreaded order from the stern came: "OK, let's reel it in." I began false casting to clear the line, all the while looking around for one more shot. I began to accept the fact that I had been skunked after five days of fishing and that I wouldn't have another shot at a tarpon for nearly a year. I looked at the water, the sky and the mangroves and tried to soak as much of it in as quickly as possible. The boat was quiet as we all processed another fishless day and began preparing to run back to the boat launch. Then at 100 or so feet a tarpon rolled. We all swung our heads and stared. We saw fins, many of them. "Hold on, get ready!" the guide yelled as he got back on the poling platform and began pushing us toward the fish. At first it looked like they were cruising at us, but as we got closer we saw the school was somewhat chaotic, not cruising nor chained up. We watched. In a matter of seconds the school gained order and began daisy chaining. There were around 20 of them, all following each other, around and around the went. They were swimming clockwise so my first shot was on the right side of the chain. No response. Same cast, same result. I was then instructed to cast inside the chain, laying only my leader over the fish going right-to-left in front of me, targeting the fish coming at me on the right side of the chain. One cast, no response. What happened next occurred over perhaps a few seconds, if that. I put a cast down inside the chain, the fly landing just to the left of the fish on the right side of the chain. I began pulling the fly away from them. One fish then broke away from the chain and made a move on the fly. It came up from below, and I looked down the mighty fish's throat as it opened wide to engulf my fly. This happened twenty five feet in front of me. I stripped to set the hook and stung the fish but the hook did not sink. In hindsight, I certainly set too soon, pulling the fly out of the fish's mouth. The fish was stung though and blew up instantly. The rest of the school did the same. I watched as the school fled and the water settled. I then turned around to look at my boat mates. We were all smiling in disbelief. "Did that just happen?" I asked. "I think so," one said.